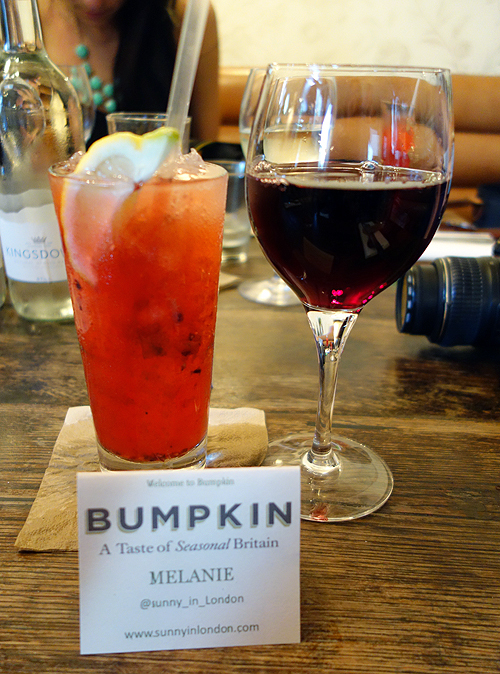 When I was invited to be one of the first guests in London to try the Summer Menu at Bumpkin Notting Hill, I was ecstatic! Wouldn’t you be? 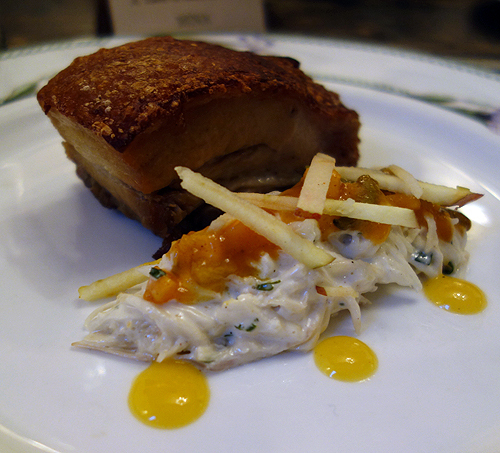 With 4 locations in London, it’s tough not to know about these restaurants focused on seasonal, authentic British food. Well, if you haven’t heard of them, it’s a good thing we bumped in to each other! I can fill you in on their hot summer selections! I arrived with 5 other fabulous London bloggers. 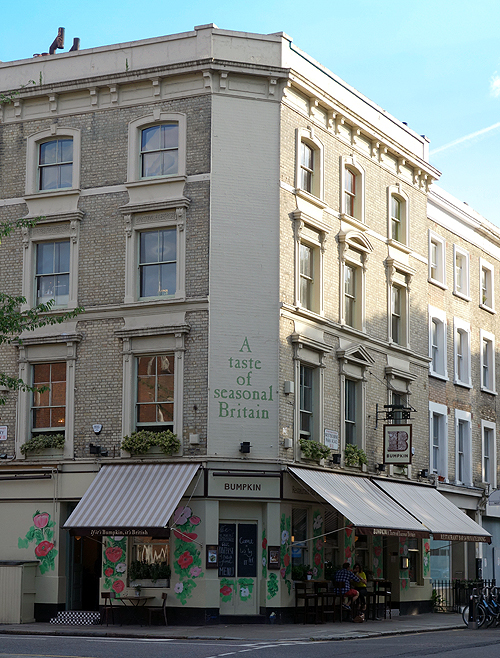 Selena the Places, Kings Road Rocks, Love and London, Adventures of a London Kiwi and Urban Pixxels. Through the past few months I’ve developed personal friendships with them, so I knew the night would be a blast! 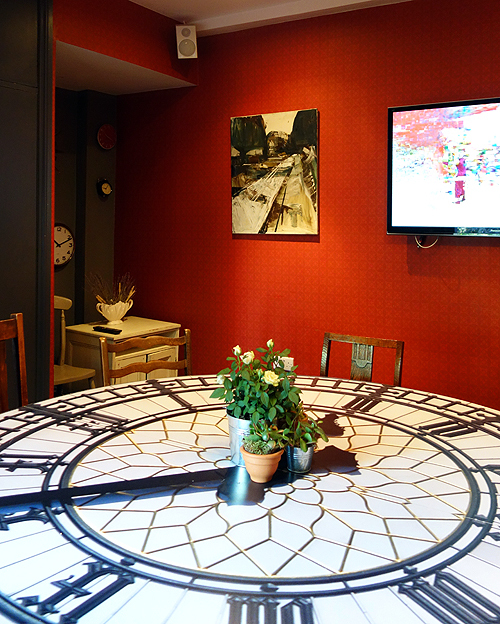 We started with a tour of the restaurant. I had no idea they had so many different rooms upstairs from the main dining area! 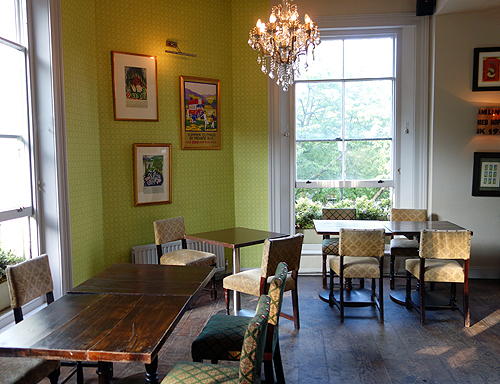 Doesn’t this look like a super fun place to relax and enjoy British cuisine and great company? And, yes, it seats a party of twelve. 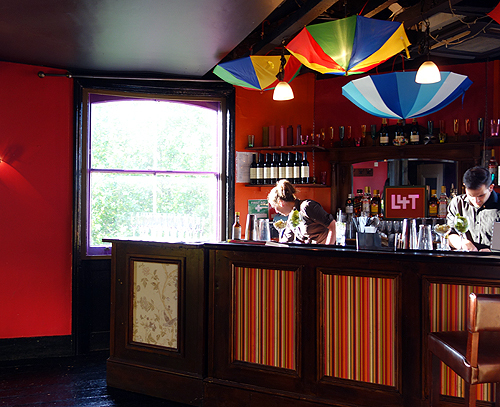 I think the Manager had a sneaky read of my post 5 Strategies for How to Host a Bloggers’ Event. 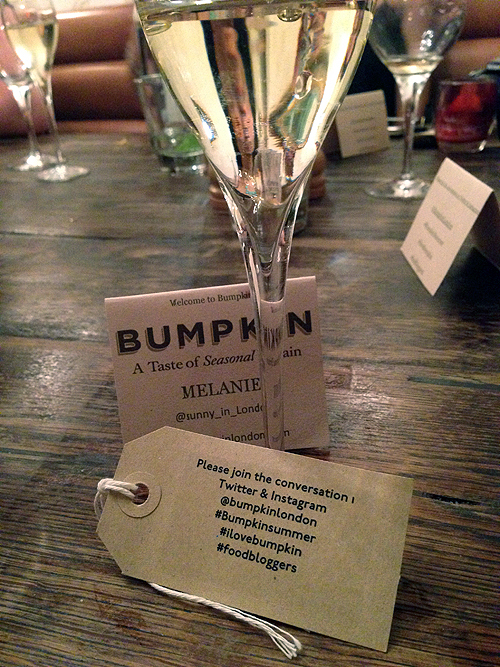 Needless to say, it was exactly what us bloggers needed to share the social media love with our followers that night. Then the drinks started flowing. Now back to the drinks. We had fresh mixed berry lemonade. The second was a cocktail that blended Blackberry Lynchburg lemonade, muddled blackberries, Jack Daniels, lemon crushed ice and soda. With my Starter and Dinner, I had a glass of Gnarly Head Vintage 2011Old Vine Zin and an Australian Circa Shiraz Viognier. 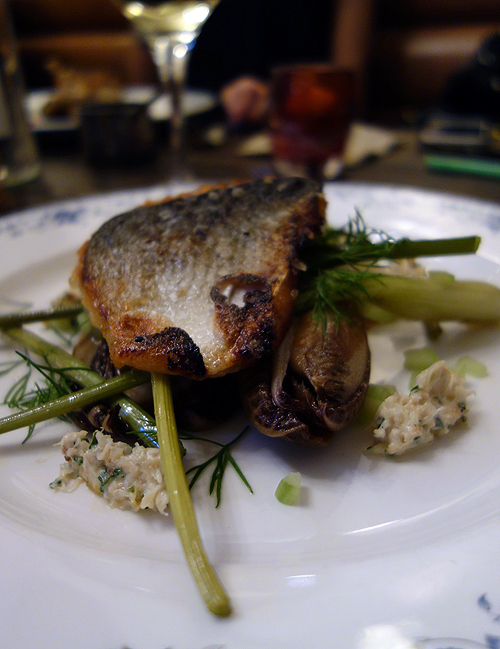 They beautifully complimented the food. 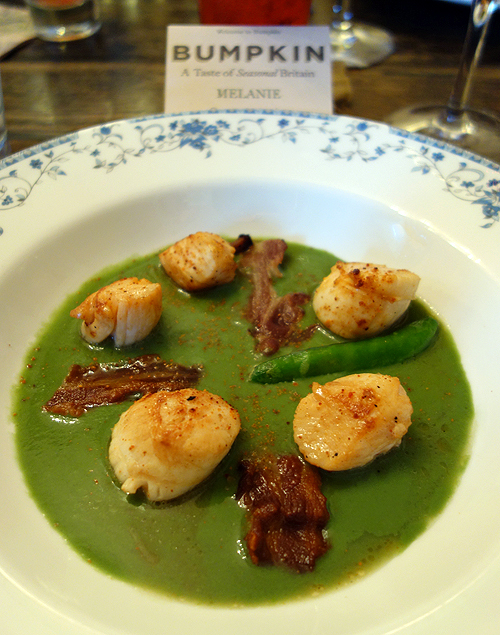 For my Starter, I selected the Pan Seared Scottish King Scallops, Chilled Pea Soup and Crispy Bacon. The scallops were definitely fit for royalty! They were cooked perfectly and flavoured beautifully. Next, I chose the Roast Southdowns Lamb Rump, Baked Heritage Carrots and Spinach. If you’re thinking ‘That’s the juiciest looking lamb I’ve ever seen.’ Well, it certainly tasted like it! I followed these two courses with a dessert. It was a Bitter Chocolate Tart, Honeycomb and Salted Caramel Mousse. 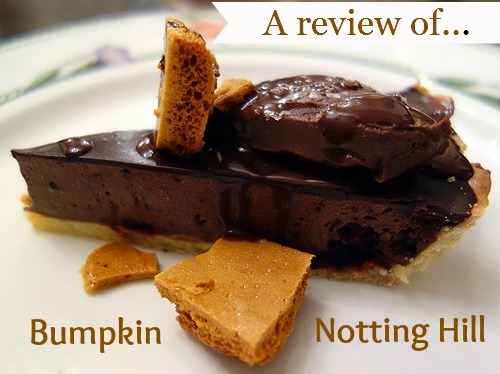 The separate flavours and textures came together for a stunning swirl of sugar heaven. Cosmic I tell ya. Other Summery desserts on their new menu are: Strawberries and Cream, Madeleine’s and a Pot of Chocolate or Baked Vanilla Custard, Poached Rhubarb and Hazelnut Crumble. 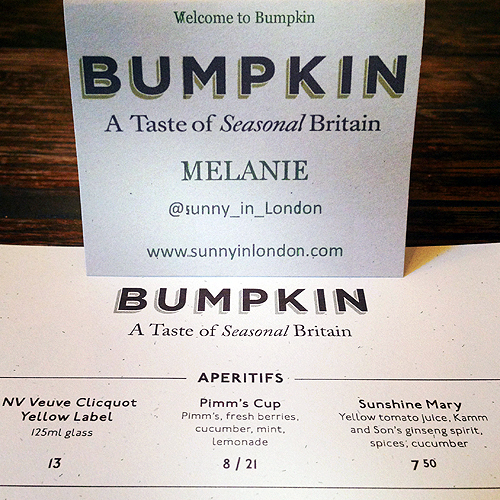 I truly fell in love with the Bumpkin Notting Hill experience. Well done, Executive Chef Raymond Fulton-Corrie! 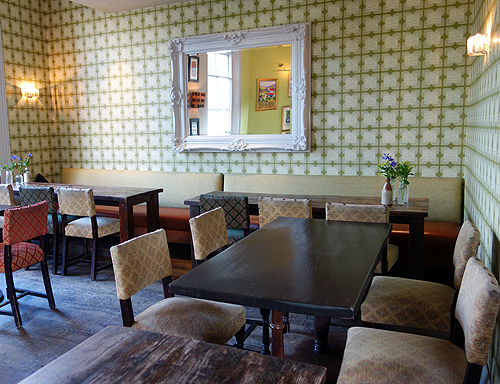 They also have Bumpkin Healthy Options included, as well as guilt free dishes, vegan and gluten-free, and hydraulic cold-pressed juices. 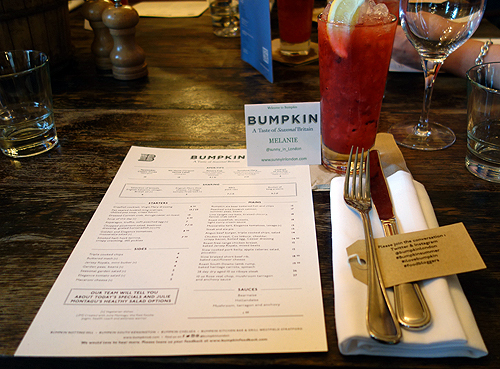 Finally, Bumpkin has a World Cup Menu at Notting Hill, Chelsea, and South Kensington. 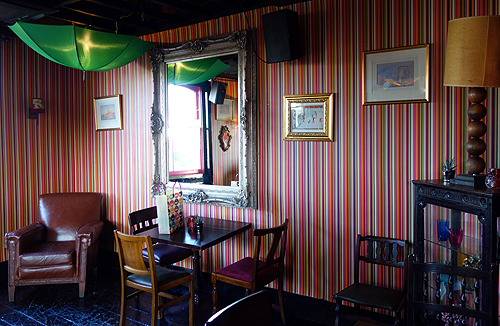 It includes Sticky BBQ Ribs, Classic Fish and Chips or an Angus Beef Burger and Triple Cooked chips, washed down with 2 Pints of house lager for only £20. 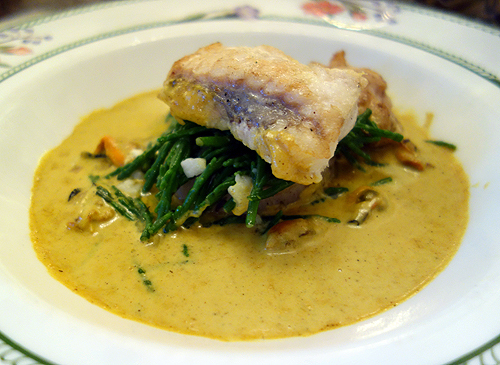 It’s available from 11am – 8pm weekdays, 12th June- 13th July in both the restaurant and private dining rooms. 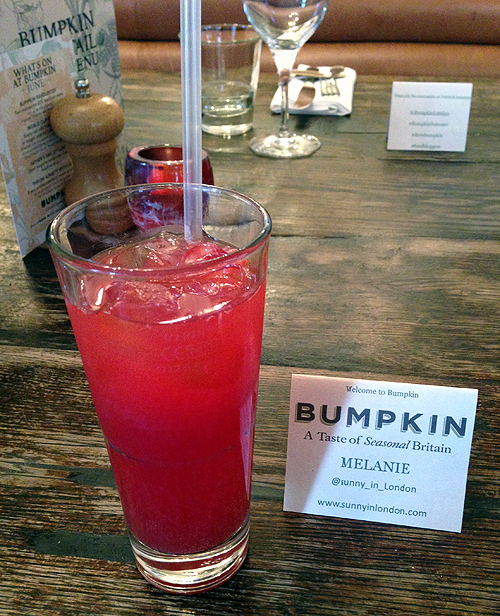 Bumpkin Notting Hill is located at 209 Westbourne Park Road, W11 1EA. 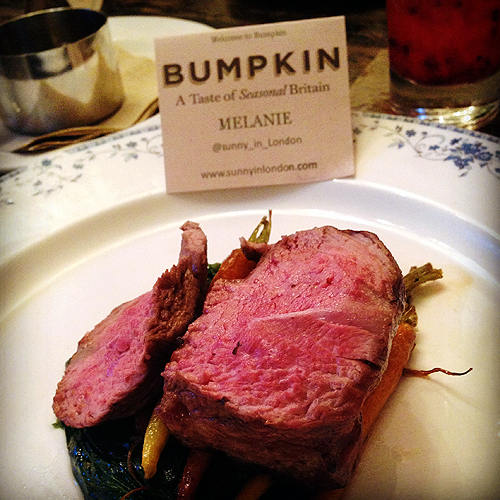 You can also check out Bumpkin on Twitter, Facebook and Pinterest. And just in case you missed it… A special thanks to Selena the Places, Kelly-Sue Budde and Bumpkin for having me as a guest at this fantastic dinner. It was lovely to meet you last night in person. 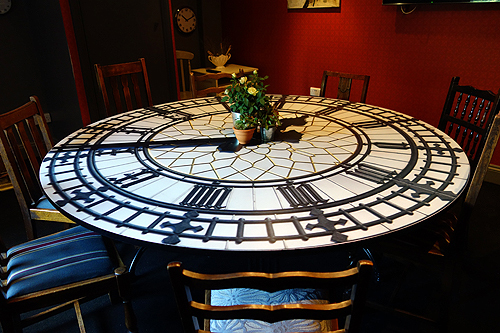 The Bumpkin interior is really lovely I like the way they have used different furnishings to change the mood of a room and the quirky features of a clock table and upside down umbrellas create interest. The food looks yummy too, seared scallops are a personal favourite.